Leopard tops and statement booties are some of the biggest trends this season. Sign me up for ALL the animal prints and statement booties, and what better way than to combine them both?! If you’re a gal who loves a statement outfit, then this outfit is right up your alley! 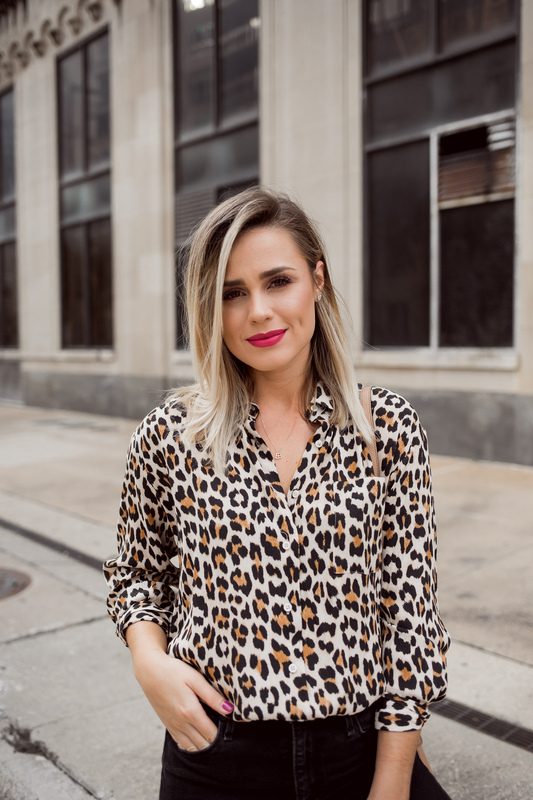 This leopard top is from Zara and is oversized. Looks great if you tuck it in as I did here, or can it can be worn untucked with some faux leather leggings. 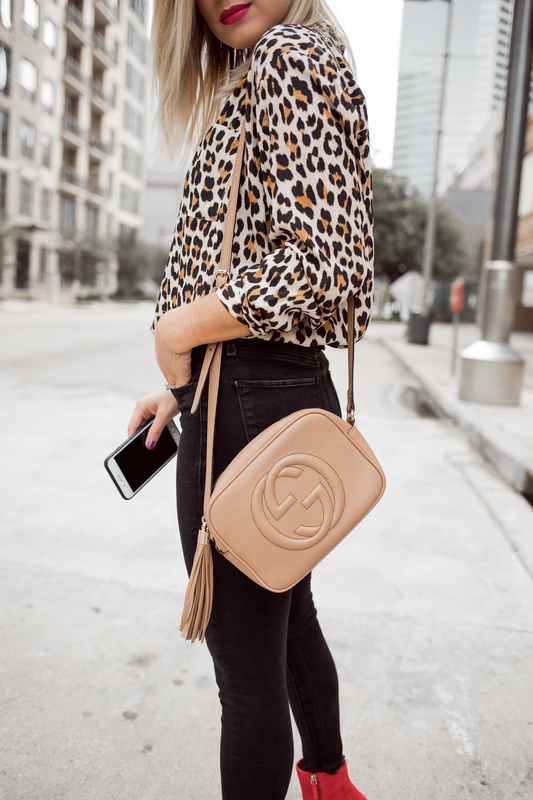 A leopard top like this is great even if you don’t want to make too much of a statement. You can wear a top like this casually with denim and flats but still look chic for those days when you’re running errands. I also want to highlight my initial necklace from AUrate. I’ve recently been introduced to AUrate, but I am blown away at the quality. They believe in buying the best you can afford, seeking out the purest 14- and 18-karat gold, procure pearls from Japan and the South Sea, and only use S1-clarity diamonds. Their designs are original and come with a lifetime guarantee. The best part is they are a giving company. For every purchase you make, you’re putting a book directly in the hands of a child who needs it. Check to see more of what they are doing, and their collections here (got this ear cuff for $40). Long story short, Jordan played football at UH (Go Coogs!) while he played at UH he was apart of FCA (Fellowship of Christian Athletes). Years later, he is now on the UH FCA board and recently became chairman of the board. Each campus that has FCA has what they call a director. These directors rely on donations. It’s how they get paid, feed their families, take students to camps, and to bring food to their weekly meets (and what student doesn’t like free food). It’s been incredible to see Jordan take on this new role with such confidence, and with such a passion. See, what many of you may not know, Jordan has a huge giving heart. His heart for others and the kingdom of God is incredible. Jordan and I have both personally witnessed how faithful God is when you’re obedient to his calling. And not just once or twice, but many times. This past weekend seeing all the dots connect, and how his “yes” 14 years ago has radically changed our lives, and others… is, amazing. But for now, that’s a little snippet😉. Love your leopard top!! Super cute!! And congratulations to Jordan! That’s so awesome that he is able to do this!! By how you’ve described him in this post, he will be so good at his job!